I’ve always been intrigued by the idea of speed dating but I am not sure I would ever do it. Speed mating on the other hand sounds like fun, and being a ‘new thing’ perfect for my 26 New Things To Do in 26 Days Before I turn 26 aka 26in26b426 (see what I did there). Before I continue let me just clarify this is ‘Mate’ as in buddy, not, well… you know. I didn’t think this would need explaining but after mentioning it to several dirty minded Australians and getting some odd looks I realised it was probably best to clarify. After being quite excited by this task, as Friday evening came ever closer I started to actually get a bit nervous. What would I talk about? How does this work? What if neither of us say anything and we just stare at each other, or worse what if they touch me? Instead of thinking through these questions I decided it was better to just drink bourbon. Arriving at the Bendigo we made a B line for the bar. Despite the place holding a few clusters of people, there were no sign of any organisers or any speed mating. We waited… and drank, waited and drank…. went outside into the awesome beer garden and waited some more. Oh and we drank. But the speed mating never happened. There were no organisers, no announcements and most importantly no bell. When we left they were in full event night mode asking people to fork over $10 to gain entry and a tube of glitter. I asked the lady on the door what happened to the speed mating and she didn’t even know anything about it. Luckily however despite not actually getting to partake in any speed mating we did meet a man called Dan in the awesome beer garden. We got chatting and like us Dan had moved to Melbourne. Dan decided to join us as we met up with some friends in town for a pub crawl and it was nice to meet a new person and also nice to speak to them for more than two minutes. However at the end of our night and on lea ving the last club, I was still itching to try a new thing! So I dragged Sarah on our route home to stop off for a souvlaki. Now souvlaki is kind of a big deal in Australia, well in Melbourne at least. A kind of rite of passage after a night out, as much so as a kebab would be to any Englishman. It didn’t take us long to find an all night Greek food joint. In fact we found two, next to each other. We went with the one closest to us that claimed to be the best since 1993. Sounded Legit.The difference between the kebab and the slouvaki is that the slouvaki is far, far less dirtier, made with more, shall we say ‘pure’ ingredients. It’s on proper Turkish pita bread that’s a bit crispy, it can be appreciated any time of day (not just when you are drunk) and whatsmore is there’s not a bottle of burger sauce in sight. We enjoyed the slouvaki so much we thought we should try the place next door too. Which we found even tastier. Sarah then proceeded to tell the nice greek lady (loudly) how much nicer her Souvlaki was to the so called ‘Souvlaki King’ next door. 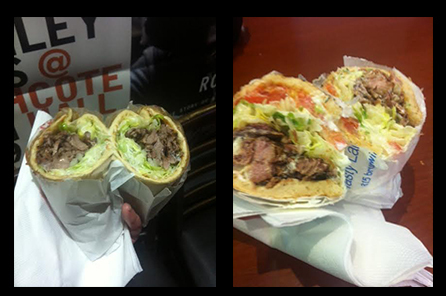 So all in all I have still yet to speed mate, although I did try, but I did eat my first ever souvlaki. 1.5 New things completed? Yeah I’ll think I will go with that. Maaaate it’s “Souvlaki”!!! And I’m not dirty minded! Ah what? This just shows how little I know about Souvlaki! Always learning something new.